He came third and broke Irish records. Hennigan raises the tricolour as he promised he would. HE GOT THERE. 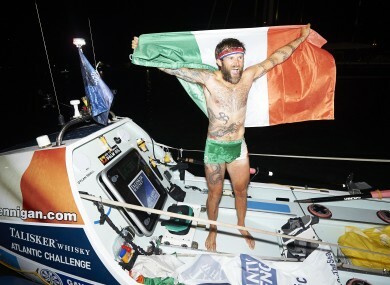 After 49 days alone on the Atlantic, Irishman Gavin Hennigan made history overnight by completing his 5,000km journey. The 35-year-old reached Antigua to finish the Talisker Whisky Atlantic Challenge in third place. “I’m so proud to have done this,” he said afterwards. “Not many Irish have attempted a solo row across the Atlantic and I feel I’ve done it in style. I had so many messages of support. I’d get up some days… and I’d be struggling but when I read the positivity in those notes and comments… from complete strangers… that would motivate me to get back on the oars and do it for them. To do it for Ireland. “The last seven days have been relentless. At times, I’ve rowed up to 19 hours a day and yesterday when I woke up, I decided it was time to finish this. I’ve rowed for the past 14 hours straight. I gave that my all. Email “Gavan Hennigan completes 5000km solo row across the Atlantic Ocean ”. Feedback on “Gavan Hennigan completes 5000km solo row across the Atlantic Ocean ”.